This shade of grey is preferred by people with a propensity to get a little teary eyed when a popular boy band breaks up. You’re a little too sensitive but you look sensational in pale trousers. People and businesses who relate to PMS 402 are very straight laced, serious, no nonsense types. Once, a few years back, a printer was mixing a batch of PMS 402 while scoffing back an exceptionally fruity yoghurt. He spontaneously combusted. The shining stars who choose PMS 406 are truly the keepers of the key to the universe. Loved by all, envied by many and fantasised about a little too often by their friends and colleagues. 406ers are often found curing contagious diseases, lessening the burden on society’s poor and downtrodden; or creating a really spectacular new soup recipe. People who relate to PMS 409 are the kind of maniacs who own goldfish. They like to know that if you die, you’re replaceable, and no one will probably even notice the you ever existed in the first place. The only way to impress them is with hilariously realistic sound effects, like the guy out of Police Academy. This is actually a metallic silver ink. So it’s sparkly and shiny and prone to glinting in the sunlight. Therefore, a person who selected this could be perceived as a bit of a magpie, no? No. A person who relates to PMS 877 is a majestical unicorn, with bells on their hooves and strands of liquorice running through their mane. They are a unique and stunning beast, frequently leaving crowds of onlookers awestruck in their wake. They also really enjoy sneezing. If you liked the look of PMS Cool Gray 3 on a personal level, you enjoy hot pants and Instagram far more than the general population. You’re above Instagramming your Starbucks cup though, you’ve narrowed it down to things with a ‘q’ in them. Like quiche, quintuplets and antique quacking kumquats. This is the shade of grey for folks with an unnatural love for novelty cake tins. Cool Gray 6 signifies a need for the sweeter, lighter, fancy free side of life. You probably own one of those pencils with a troll doll wedged on top, and balk at the idea of wearing overalls. This is the shade of grey most preferred by elephants, sea lions and other large, lumbering beasts. If this is your shade refrain from growing a moustache. It will only only bring out your inner walrus. If you often wake in the morning (or early evening) to find yourself slathered in a thick, oily coating of PMS Cool Gray 9, you are the type to earn/win/collect/happen upon a stupid amount of money. You are practically Scrooge McDuck. In your later years you’ll likely take to collecting donkeys. Once your pet dolphin dies, of course. If you like PMS Cool Gray 11 it is possible that you will be elected as the new Pope. You look just swell in a hat, you do, and don’t even get me started your ability to pull off a swanky robe with a sickening amount of jewellery. 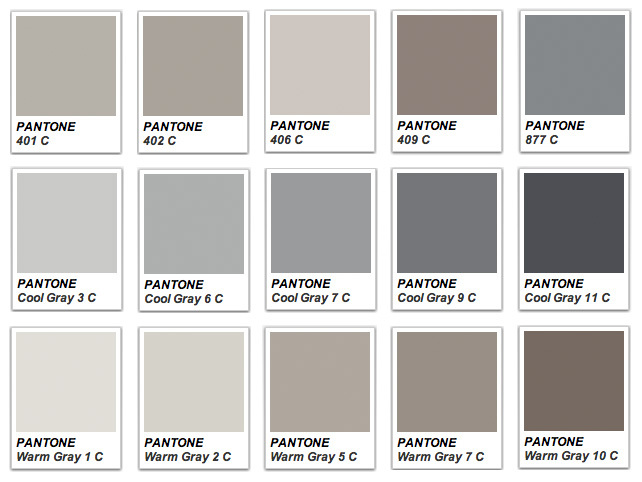 If you can relate to PMS Warm Gray 1 then you are a perfectly normal human being. You’re fairly average in every way and everything you do is middle-of-the-road and inoffensive. Sometimes, when you feel a little wild, you order an extra side of bacon. Only sometimes, mind. PMS Warm Gray 2 signifies a person with sleeping difficulties. Maybe you have a medical condition. Maybe you have a cat that likes to sit on your face. Maybe you were dared to drink 259 cans of energy drink back in 2009 and haven’t managed to get a wink yet. If you love the look, feel and smell of PMS Warm Gray 5, then congratulations. You are the person the Furby was invented to impress. Please take it away and be impressed by it elsewhere. The rest of us are annoyed. PMS Warm Gray 7, huh. If that’s your shade you are incredibly special. Your talents and abilities are so complex and rarified that they truly shine like a beacon in the night. Unfortunately, you were born 600 years too early, so in this day and age your talents are completely useless. Instead of shining like a beacon in the night you’ll have to make do with waddling about like a duck who is slightly lame. If this is your shade, you’re not really all that grey. You’re a bit browner than grey really should be. You like to dance on the edge of social acceptability by wearing comedy underpants and t-shirts with slightly clever sayings on them that you didn’t come up with and don’t quite understand. You also frequently find yourself in long, drawn out conversations with cats. Nice to see an intelligent comment on the Fifty Shades of Grey tragedy, sorry, trilogy.